“Democratic socialists believe that both the economy and society should be run democratically—to meet public needs, not to make profits for a few. To achieve a more just society, many structures of our government and economy must be radically transformed through greater economic and social democracy so that ordinary Americans can participate in the many decisions that affect our lives. Is it really true that socialism and democracy are inseparable? No. It’s actually a nonsensical assertion. In fact, the whole concept of ‘Democratic Socialism’ is utterly oxymoronic. In reality, the majority of people across the world support the free market, not central planning. Consider that a 2014 Pew Research poll of 25 advanced, emerging, and developing countries, found that “in 21 of the 25 countries surveyed agree that most people are better off in a free market system even if there is some inequality…A global median of 66% say most people are better off under capitalism, even if some people are rich and some are poor.” 70% of the US correspondents agreed. Another Pew poll regarding free trade, which is generally opposed by Democratic Socialists as they are more often than not also protectionists, found that an average of 58% of people in 28 European countries support a free trade agreement with the United States. 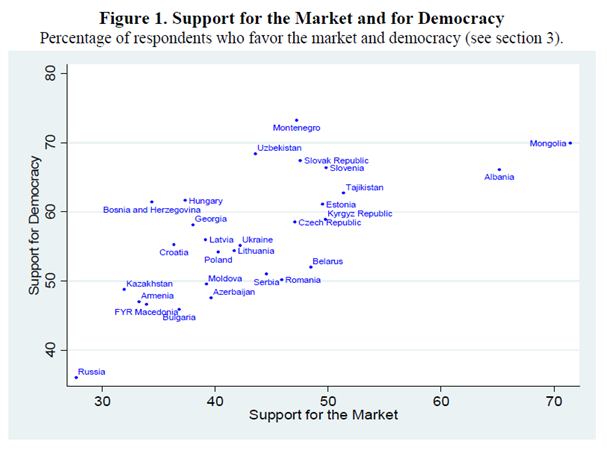 Similarly, using data from a 2006 survey of citizens in 28 formerly socialist countries, economists from UC Berkeley and the Paris School of Economics found that “[there is] a positive and significant effect of democracy on support for a market economy.” There authors go on to note that “there is no historical evidence of a democratic society without a market economy.” Indeed, this is a point even the Democratic Socialists of America have conceded. In a Q&A section on their website they admit that “no country has fully instituted democratic socialism.” Central planning simply isn’t democratic, even if socialists would like it to be. 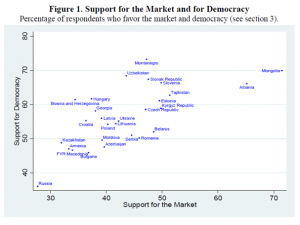 Ultimately, it seems safe to conclude that democracy promotes market capitalism, not ‘democratic socialism’. If Democratic Socialists actually care about democracy than they should accept the people’s decision to support free markets. We need more countries to try new types of social systems. Seasteading might be the way to go.